I thought I must write to you because you are in the news these days and your leader is in remand prison, all because of a scuffle that broke out at a court house. As a result, a lot of people are confused about who you are and what you do and some even think that you are a group of politicians! Let me explain why. What we saw last week was a group of people, some of them in yellow robes, trying to force their way in to a court house, shouting insults and making demands. We do not see that every day and that is not quite in keeping with the Buddhism that most people are familiar with. This group, although wearing yellow robes and presenting themselves as Buddhist monks, were using very colourful language, abusing policemen and judges, insulting other communities, inciting racial hatred and even scaling walls of the courthouse like pickpockets fleeing the Police! Their words and deeds resembled street thugs although they wore yellow robes- and even our eternally dissatisfied university students show more dignity and restraint when they engage in their protests. Seeing that, a lot of people were ashamed to call themselves Buddhists on that day! 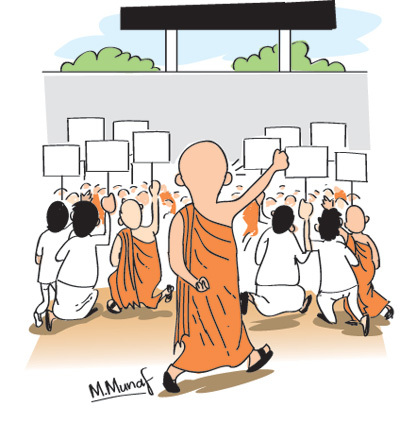 I am not sure whether you realise this, but people in this country respect the yellow robe not only because those who wear it represent the maha sangha but also because they command respect by their words and deeds. Some of that respect was lost that day and that is very sad indeed. We are told all this was because the leader of your ‘Senaawa’ had been remanded for disrupting court proceedings the previous day. That, I am told, is a story in itself. He apparently addressed court and gave a piece of his mind about what he thought of the court proceedings in very descriptive language. Your leader was annoyed that the disappearance of a journalist was being inquired in to. He labelled the journalist a ‘kotiya’ and blamed the authorities for prosecuting military officers for the disappearance. So, he was told to behave properly in the court house but he didn’t do so. That is when an order was made for him to be remanded. I don’t know why that should be such a shock because now, unlike a few years ago, whenever someone does something wrong, the courts decide what should be done. Remember, even Hirunika had to face the music for what she did. I am not sure whether you are aware of this, members of the ‘Senaawa’, but wearing a yellow robe and claiming to represent the majority community and majority religion do not automatically give you the right to break laws and do as you please, insulting other communities and religions. Also, just over a year ago, thugs masquerading as politicians were engaging in all kinds of nefarious activities but the rule of the law didn’t apply to them. Pardon me if I am wrong, but I cannot remember your ‘Senaawa’ or your leader say a single word, against Mervyn, for instance. So, gone are the days when your leader could storm other peoples’ press conferences, chase them away and then slander them and threaten them- because, if memory serves me right, that is what he used to do. He didn’t face any consequences at all for doing so either- and we all wondered why! Gone also are the days when your leader could address meetings, openly asking one community to attack another- because, if memory serves me right, that is what he did at Aluthgama. That led to riots that left several people dead and dozens of houses destroyed. He wasn’t taken to task for that either. Because your leader got away after doing all that, people were even saying that he had Mahinda maama’s blessings. I don’t know about that but what I know is that by not taking action against him, Mahinda maama lost a few hundred thousand ‘minority’ votes which probably cost him the election. Now too there will be politicians who will want to stand by your leader’s side and claim to be his saviours. Why, the other day we saw ‘rupiyal seeye’ Udaya suddenly appearing by his side at the court house. Next, we will see this whole issue becoming a battle between different communities. Dear members of the ‘Senaawa’, this country lost thousands of lives because of the war. So, now is not the time to start another war between its communities but that is exactly what your leader seems to want. I don’t think the majority of us want that. Think about that before you plan your next protest. PS: Your leader said the other day that that he was shocked that war heroes were being ‘locked up’ while Tigers were being pardoned. He asked whether we had forgotten that there was a war in this country. Pardon me, but was your leader deep in slumber when the Field Marshal who was then a General was locked up while Karuna was sent to Parliament? Your leader seems to have conveniently forgotten that. Or, was he touring Norway at the time?